I started 2017 with big plans. I decided to start blogging again and make a return to the community speaking circuit after quite a long hiatus from running user groups, speaking, and generally engaging with the developer community. Although I spoke occasionally over the last few years I never came close to my historic peak of 3-4 times a month. There was no drama associated with my decision at the time it was simply a hard schedule to keep up with a family and small kids. A short break turned into a long break which turned into a hiatus. Truth be told though by 2013 I was getting pretty bored with SharePoint and was struggling with interest and motivation. I was a bit nervous and honestly a little out of practice but I felt that tug once again and the thrill of talking about technology that I’m passionate and excited about so I ended the year at almost a dozen community events across the north and southeast. From New York City, Washington DC, Charlotte, and Atlanta to several local events in the Raleigh area I've had the opportunity to connect with lots of old friends and make quite a few new ones. 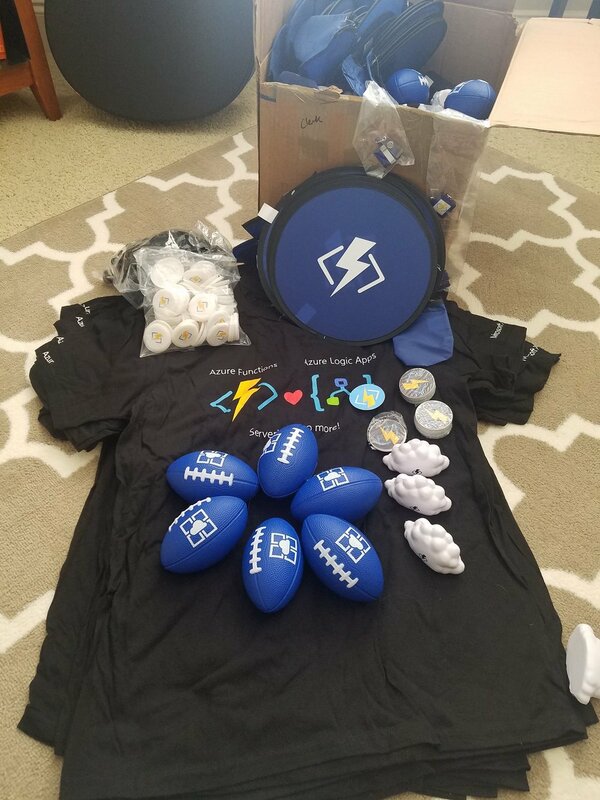 I also was very excited to be able to get some awesome swag from the Azure Functions team to give out during several of my presentations as well. Some of the topics of my various talks included Azure Architecture, Serverless, Azure Functions, Logic Apps, Azure App Services, Office 365, Microsoft Flow, CosmosDB, and Angular. I managed to get a few blog posts out along the way. Although a couple got some surprising amounts of traffic I was nowhere near my goal but it's a start! Along the way I had the fortune to attend a couple great conferences including the Microsoft Build Conference in May and the All Things Open Conference later in the year. I'm once again routinely attending various user groups and meetings and I've become a co-organizer in the new Raleigh Serverless Meetup which I hope to help grow this year and bring in various speakers from the area to talk on one of the subjects I'm most excited about - Serverless! Although I consider 2017 a bit of a transition year for me I've left 2017 pretty satisfied and entered 2018 very excited about things to come. With that in mind I've set a few goals for myself for the coming year. This is one of the categories where you can never really stop growing but I have specific areas I want to work on. I want more polish to my presentations and ensure my presentations end on time and hitting all my goals for the talk. I am challenged at times with being able to zero in my content well for 50-90 minute sessions so I'm going to work hard to refine my sessions and spend more time doing dry runs. As a by product of this I'll likely start sharing some videos of some of my talks as well. Expand my speaking area and community outreach. For the most part I kept to my region for my talks this year. Most of it was financial and schedule driven but if it was < 8 hour drive it was fair game (and still is!). With a modest budget this year I plan to expand that to the rest of the country (or maybe beyond - we'll see!) . I still love presenting locally and will continue to do so but I'm excited for the opportunity to connect with other communities throughout the country. Grow as a cloud advocate. The excitement and potential I see in the cloud reminds me of my early days of SharePoint, getting access to those early glimpses of SharePoint 2007 and then SharePoint 2010 and seeing all the potential and riding the excitement of the community - man the SharePoint community was and is still something very special! For me today that sense of excitement is how I feel about Azure and the cloud. I'm going to work to grow in the Azure community and explore and share even more of the awesomeness that is the cloud and especially Serverless. I have benefited professionally in so many ways from open source over the years that I think it's important for me to recognize this and actively participate and support the projects that I benefit from and am passionate about. With this in mind I'm going to pick an open source project to contribute to with my time and one to contribute to financially (I am no bill gates but I know sometimes every bit helps). My son, 14, is taking his first computer programming class in 8th grade and like most 14 year old he is all about his Xbox and more recently with his PC games. He started asking some questions about how to "mod" some of his games and with that motivation we're going to get started with some Unity game development. We'll see if we can have a little fun and just maybe spark some interest. Of all my goals I just might be most excited about this one! I'm going to approach 2018 with a little more focus and a little more methodology but I'll stick to my over optimistic goals and see where it takes me! Hope to see you along the way!